Earlier today Facebook announced a few major features it has developed. 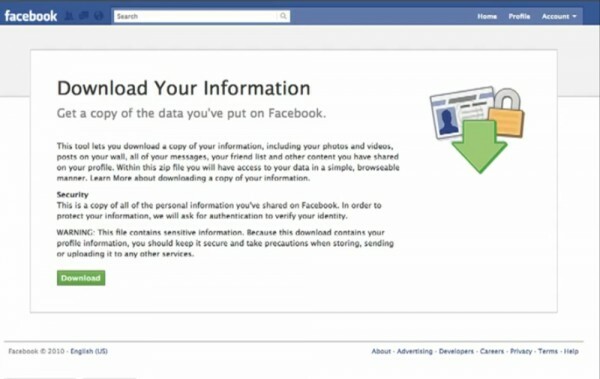 The first being that users now have the ability to download any information they have put on Facebook. Next is a new app dashboard which displays the data accessible sorted by individual app. Finally, the company announced a change to its Groups feature, making it easier to connect with your real life social groups. Keep reading for more details. The first and perhaps the most important new feature is the ability to download your information from Facebook. This means that users’ data will no longer be trapped. I think the company has implemented this feature in a pretty cool way. The file is downloaded in a .zip format, so after unzipping it, users can open the “index.html” file in a web browser and access all their information. This includes status updates, wall posts, photos, etc from an interface remarkably similar to your profile page. Next is the new app dashboard which shows each of the apps you’ve installed and what data those apps are accessing. In addition, users can change what information each app is able to access. This is definitely a much needed privacy feature since it was quite difficult to change application settings. Finally, the new Groups feature seems to be quite promising. I use Facebook very infrequently because I don’t want all my status updates going to every single one of my friends. Sure I was able to manage this using lists, but that was extremely time consuming, however, if I can create a group for my closest friends, I may actually start using Facebook more often. This seems to be exactly what the company was thinking as Zuckerberg stated that the whole point of having groups was to mirror the social groups that we have in real life and how the lists feature did not do that very well. For those of you who have spent a lot of time setting up lists and tweaking them to your liking, don’t worry. Groups will not be in place or lists, rather in addition, meaning that all that hard work wasn’t wasted. Facebook talked about some pretty important things today and presented quite a few solutions. Many people, including myself, have been complaining about the lack of privacy and difficulty of saving data from Facebook. Hopefully, the ability to download all your personal data, as well as being able to control the information apps can view on an individual level will bring us closer to having a more safe, secure and more accessible Facebook.